After the court victory against the financial blockade imposed by Visa and MasterCard to WikiLeaks donation, now WikiLeaks is opening a new path in its battle to breakthrough the banking siege. In early Wednesday morning, WikiLeaks announced via its twitter feed while saying it could now accept donations through a French non-profit. "After almost two years of fighting an unlawful banking blockade by US financial giants VISA and MasterCard, WikiLeaks has announced it is back open for donations. After WikiLeaks’ publications revealing US war crimes and statecraft in 2010, US financial institutions erected a banking blockade against WikiLeaks wholly outside of any judicial or administrative process. 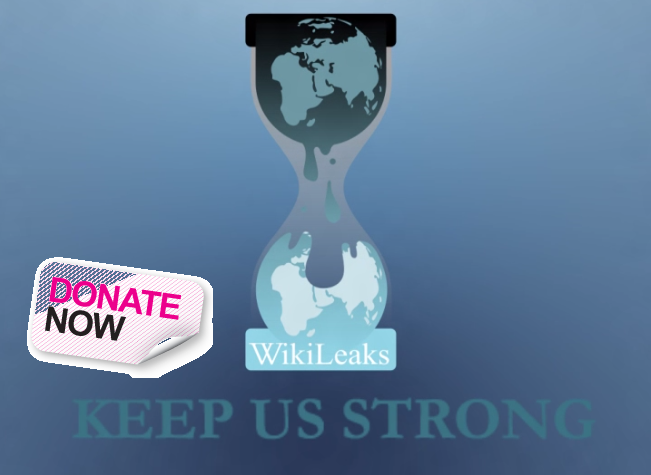 The blockade came during a time of substantial economic growth for WikiLeaks but blocked more than 95% of donations, costing the organization in excess of USD 20 million. The Wau Holland Transparency Reports for WikiLeaks’ finances, released today, illustrate the financial consequences of 18 consecutive months of economic censorship. For the year 2011, the blockade resulted in WikiLeaks’ income falling to just 21% of its operating costs. WikiLeaks has been forced to run on its cash reserves at the Wau Holland Foundation, which have diminished from EUR 800,000 at the end of December 2010, to less than EUR 100,000 at the end of June 2012. As the graph shows, WikiLeaks’ reserve funds will expire at the current austere rate of expenditure within a few months. In order to effectively continue its mission, WikiLeaks must raise a minimum of EUR 1 million immediately. Against this background, WikiLeaks is launching a new payment gateway, designed to work around the blockade. The French credit card system, Carte Bleue, is coupled with the VISA/MasterCard system globally. VISA and MasterCard are contractually barred from directly cutting off merchants through the Carte Bleue system. The French non-profit FDNN (Fund for the Defense of Net Neutrality- Fonds de Défense de la Net Neutralité) has set up a Carte Bleue fund for WikiLeaks. WikiLeaks advises all global supporters to make use of this avenue immediately before VISA/MasterCard attempts to shut it down. However, WikiLeaks and FDNN are ready for the fight. Julian Assange, WikiLeaks’ founder said: "We beat them in Iceland and, by God, we’ll beat them in France as well. Let them shut it down. Let them demonstrate to the world once again their corrupt pandering to Washington. We’re waiting. Our lawyers are waiting. The whole world is waiting. Do it."